This Clamp Lamp with 5X Magnification, 4.1" Diameter Lens perfect for reading, cross stitching, knitting, crocheting, beading or other hobbies. so that they can see their work or hobbies with ease and without glare. Stepless Dimming - Long press brightness button can allows you to easily adjust the brightness level between 10% and 100% to achieve the perfect lighting. easily find the perfect lighting for your project. 3 color tempertures optional- This lamp have 3000K-4000K-5000K (3 color tempertures) Satisfy your different lighting needs. The strong metal clamp can be clipped on any flat surface that the thickness is less than 2"/5cm(max) thick. Space saving, conveniently attaches to a desk, workbench or table. suitable for reading,office,art workshop,architect,etc. The lamp head can be adjusted 220° up and down, and 350° swivel. 13.7+13.7" extendable long arm and folded to 15.7"
Adopting diffusion translucent material, close to daylight illumination, emitting soft light without ghost, glare or flicker. 【5X Magnification】This Clamp Lamp with 5X Magnification, 4.1" Diameter Lens perfect for reading, cross stitching, knitting, crocheting, beading or other hobbies. so that they can see their work or hobbies with ease and without glare. 【Stepless Dimming】Stepless Dimming - Long press brightness button can allows you to easily adjust the brightness level between 10% and 100% to achieve the perfect lighting. easily find the perfect lighting for your project. 3 color temperatures optional- This lamp have 3000K-4000K-6500K (3 color temperatures) Satisfy your different lighting needs. 【Desk lamp clamp, Easy to install】The strong metal clamp can be clipped on any flat surface that the thickness is less than 2"/5cm(max) thick. Space saving, conveniently attaches to a desk, workbench or table. suitable for reading,office,art workshop,architect,etc. 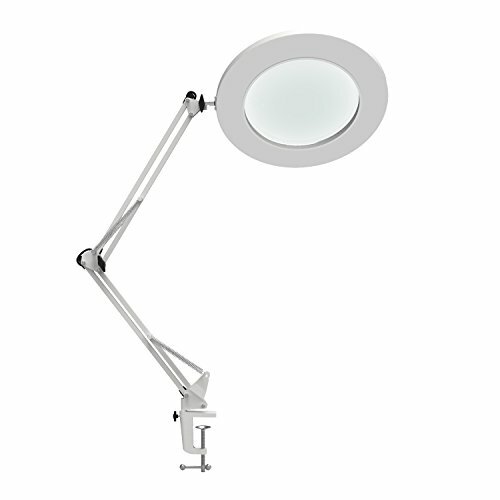 【Highly adjustable swing arm】The lamp head can be adjusted 220° up and down, and 350° swivel. 13.7+13.7" extendable long arm and folded to 15.7"
【Professional Eye Protection】Adopting diffusion translucent material, close to daylight illumination, emitting soft light without ghost, glare or flicker.